CIRCLE Entertainment’s latest title, Castle Conquerors EX, for the 3DS eShop was teased in August as the sixth release in the real-time strategy series, with plenty of improvements promised over the DSiWare original. 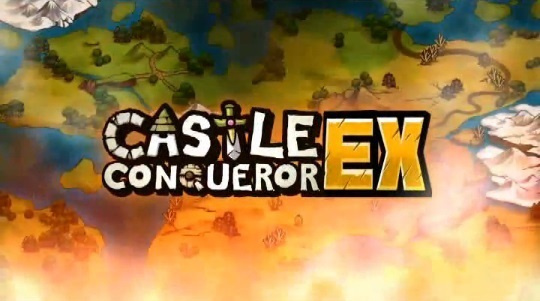 Now, the prolific digital developer has revealed Castle Conqueror EX is invading the North American 3DS eShop later this week on 23rd October, for US$3.99. A European release is also on its way, with the game currently undergoing the classification phase. If you weren’t already familiar with previous iterations in the series, Castle Conqueror EX is a real-time strategy game where players take on the role of 1 of 4 heroes, with the task of leading soldiers into battle, seizing the enemy castle, and banishing The Empire from the land. The title includes 50 levels, 4 unique heroes, reworked AI and level design, a complete makeover of the item and hero abilities, an exclusive 3DS Play Coin feature to boost battle effects in-game, and promises easy to learn but hard to master gameplay. Check out the official trailer below, and let us know if you'll be downloading this 3DS eShop title on release. Too many games! Not enough time! I might give this one a shot actually depending on my budget. Got the email about this too, still unsure of if its my type of game, but Circle has been bringing over some very impressive titles in the past few months so I bet it'll be good! Not sure if it's a big enough improvement over the 2 I already played. Plus no 3d kinda kills it for me. @Spoony_Tech No 3D? Damn, this better be worth it. I'm kind of itching to finally get into RTS for once. @TheWPCTraveler Well I'm assuming no 3d since the action is all on the bottom screen so if there is 3d it's not gameplay 3d just menu. @Spoony_Tech Well, it's CIRCLE, I have my doubts. Will get this with or without 3D, anyway. I do like castle conqueror but unfortunately that's another game I'll have to put on my play next year list. I'd be interested if there's still something to do when you're done with all the levels. Like a random mode similar to what Dairojo! has. Castle Conquerors is a fun game. I had it on the DSi, I will make plans to pick this one up as well, 3D or not. I have had this on my 3DS within the 1st month of getting 3DS and the e-shop going live and I LOVED this game!! I am intrigued by this one because the original game was ALOT of fun.... Seeing this posting......... makes me want to play it again, been well over a year since I last played it. I've never played these before. Maybe its time to get one. I will wait for a review even though most people seem to really enjoy the other releases. So much to play and Fantasy Life coming out on Friday. Usually I don't like RTS games, but this one looks interesting. Hopefully it will have a demo so I can try it out, otherwise might not be worth it to me.